Systematic Immunity, from Felix Wunderlich, is a game that takes place inside the human body... a terribly infected human body. You take on the role of a cluster of white blood cells, and it is your job to rid your human host of infection by getting as many cells as possible to the germ cluster that lies beyond a series of precision platforming challenges. Lose too many cells, and you need to start the level from scratch. The game takes place across 75 levels in the stomach, lungs, and brains, each offering their own challenges, such as acid in the stomach, heavy winds in the lungs, and electrical impulses in the brain. 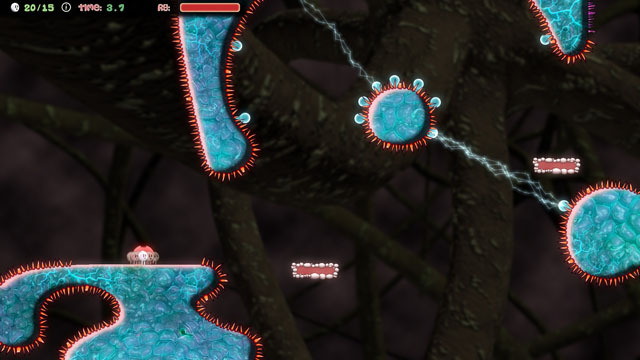 Players must run up the sides of tar-packed lung tissue, roll under spikes, and wrap themselves in a protective bubble to float around obstacles if they hope to defeat the ever-present germs and the boss creatures that appear at the end of each themed area.